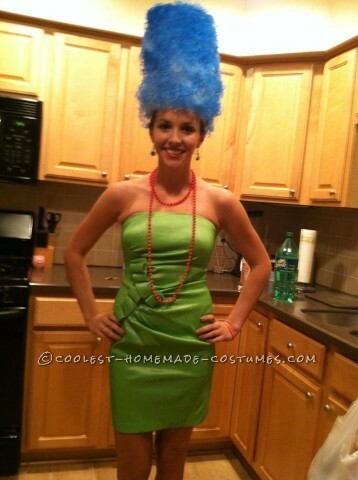 One of my many nicknames is Marge so I though it would be fun to be “Marge” for the night. To make my hair I took two 2-liter soda bottles and glued them together. I purchased a plan white wig and cotton balls, spray painted them blue and glued them onto the soda bottles. The dress I was lucky and found for $10 at a cheap clothing store. The necklace and braclet were party beads I found in my apartment that I just painted red. Very simple to make but you have to have paitence glueing the hair and cotton balls, can get messy!